Almaty, Kazakhstan__ Western diplomats said Thursday they hope Iran comes here with a “clear and concrete” response to a revised international proposal aimed at curbing Iran’s most sensitive nuclear work. European Union foreign policy chief Catherine Ashton “calls upon Iran to give a clear and concrete answer to the E3/EU+3’s Almaty proposal,” Michael Mann, a spokesman for Ashton, said Thursday. Diplomats from Iran and six world powers are gathering here ahead of the third set of nuclear talks in the past five weeks, which are due to get underway Friday. International negotiators presented a revised international proposal at high level talks held in Almaty in February, and then held technical talks in Istanbul last month. The Iranian negotiating team is expected on Friday to present a response to the latest P5+1 proposal, that includes Iran’s suggested steps, an Iranian source suggested Thursday. Iran’s counter proposal will aim “to test” western intentions, he said. Striking a familiar theme, Jalili also criticized nuclear armed world powers that seek to limit other countries’ nuclear rights. 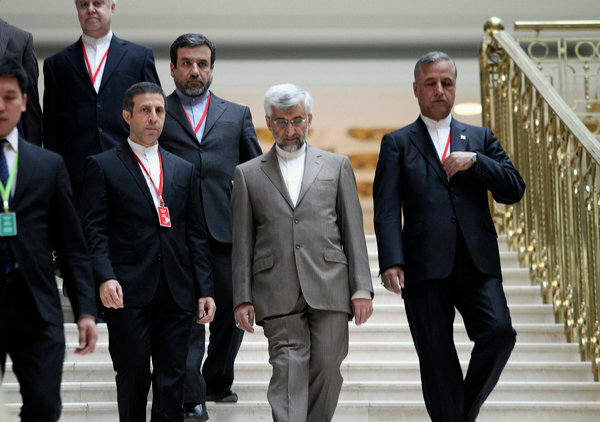 “No country should have a nuclear weapon,” Jalili said. Despite the tough tone, western diplomats said Iranian technical experts were particularly engaged and focused on substantive details at technical talks held in Istanbul March 18th that went on for twelve hours. The Iranian technical team was not authorized to negotiate, however, the American diplomat said, but rather to seek more information and clarification on the international proposal. The Iranian team, in Istanbul, indicated Tehran was considering an international request to suspend 20% enrichment for six months, and to continue converting Iran’s stockpile of 20% enriched uranium to oxide for medical use, a diplomatic source told Al-Monitor last month. However, the Iranian team expressed objections to other elements in the international proposal, the diplomat said. Among them: suspending other operations at the Fordo facility except 20% enrichment, shipping out its 20% stockpile, and increased IAEA inspections. Iranian diplomats have also said that while they consider the revised international proposal an improvement from one presented in Baghdad last year, they still find it “imbalanced” between its demands and the incentives it offers. The British, French and German foreign ministers called Friday for intensifying European Union sanctions on Iran, as western powers sought to show resolve in the face of Iran’s nuclear defiance and deter possible Israeli military action. “It is necessary to increase pressure on Iran, to intensify sanctions, to add further to EU sanctions that are already enforced,” British Foreign Secretary William Hague told reporters ahead of an informal meeting of European Union foreign ministers in Cyprus Friday, Reuters reported. “Sanctions are necessary and soon. I can’t see there is really a constructive will on the Iranian side for substantial talks,” German Foreign Minister Guido Westerwelle told Reuters. The United States has also prepared a new file of sanctions that are aimed at squeezing Iranian financial reserves, diplomatic sources told Al-Monitor. The show of resolve came as nuclear negotiations between six world powers and Iran remain at an impasse. Three rounds of meetings this year, and European oil sanctions that went into effect in July, have so far failed to persuade Iran to agree to international demands that it “stop, ship and shut” its higher level 20% uranium enrichment activities and close its fortified Fordow enrichment facility. Iran has said it would be willing to discuss ending its 20% enrichment but wants recognition of its right to lower level enrichment for energy purposes, and sanctions relief. Political directors from the P5+1, conferring in a conference call last week, decided not to hold another P5+1/Iran meeting at this time, the diplomatic sources said. Of the six nations that make up the group–the United States, UK, France, Germany, China and Russia–only Moscow’s envoy expressed support for another meeting, a western diplomatic source told Al-Monitor on condition of anonymity. “Even the Chinese opposed” a meeting now, as no success is expected. Efforts by the UN atomic watchdog agency to get access to an Iranian military base are similarly at an impasse. The International Atomic Energy Agency (IAEA) reported in August that Iran had been engaging in an extensive clean up at the Parchin base, which some agency inspectors suspect may have been previously used to test a nuclear explosive device. Iran insists that its nuclear program is for peaceful energy purposes.